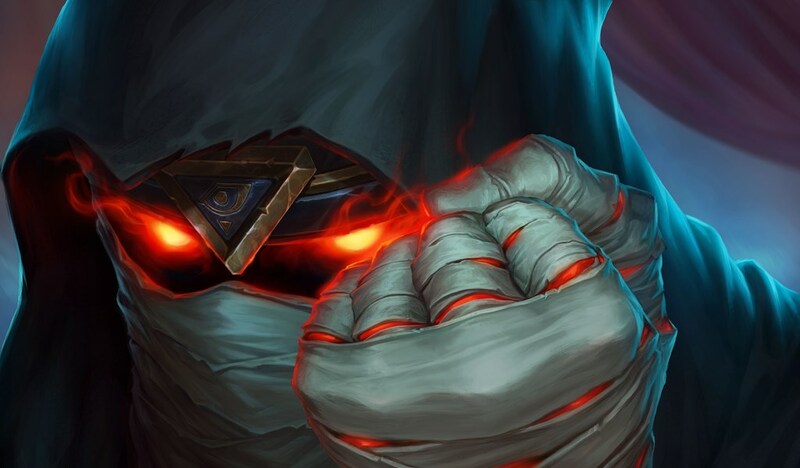 We already knew that Madame Lazul is a part of the league of E.V.I.L who will be opposing Hearthstone fans in the upcoming Rise of Shadows expansion. But now we know that she’s also a Legendary minion for the Priest class. In card form, Lazul is a three-cost minion with three attack and two health. 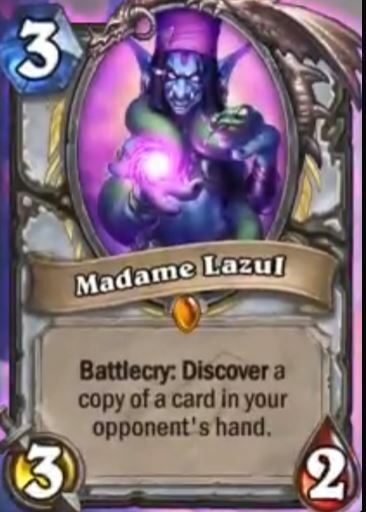 Madame Lazul’s Battlecry allows you to discover a copy of a card in your opponent’s hand. If you’re a Control player and you felt disenfranchised by the aggro meta at the beginning of Rastakhan’s Rumble, then it looks like Rise of Shadows might be answering your prayers. Madame Lazul generates a ton of value for such a low-cost card. It’ll be interesting to see how much play she gets in Priest decks during the early days of the expansion. Madame Lazul is also the face of the new Priest portrait that can be unlocked by purchasing the Mega Bundle for Rise of Shadows. The Mega Bundle includes 80 Rise of Shadows card packs, the Madame Lazul hero portrait, the Jewel of Lazul card back, and a random golden Legendary. The bundle can be purchased for $79.99. Considering how much of her we’ve seen thus far, it’s safe to say Madame Lazul will be a major character with regard to the lore of the expansion. If you’re a Priest player, she might also be your strongest ally.